If we worked out a mathematical formula for most-beloved Celtic per minutes on the parquet, Isaiah Thomas may just walk away with the award. I maintain that Danny Ainge's trade of Isaiah was a solid business move, but it hurt like Hell. This guy was brought in as a backup, and then literally resurrected a stumbling franchise. This story isn't about shoes - well in part, it is. Thomas' sister, Chyna, died in an auto accident on April 15, 2017. He gutted out the grief and tragedy and was on the court for the memorable (understatement) Game Two of the playoff series versus the Wizards. Lesser warriors might have folded, but not Isaiah. 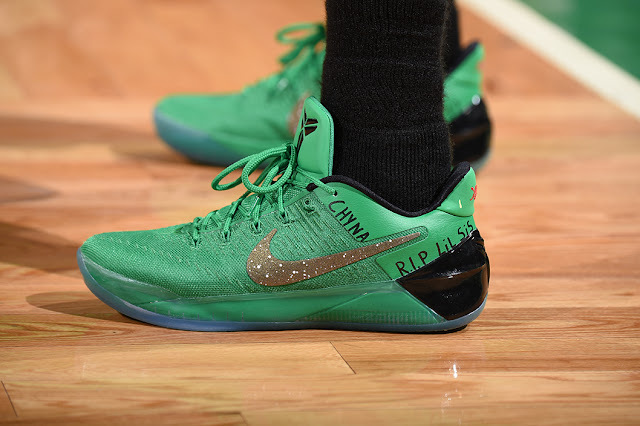 In one of the most spectacular performances ever witnessed by a Boston crowd very-accustomed to such things, Thomas went off for 53 points on the day his beloved sister would have turned 23. 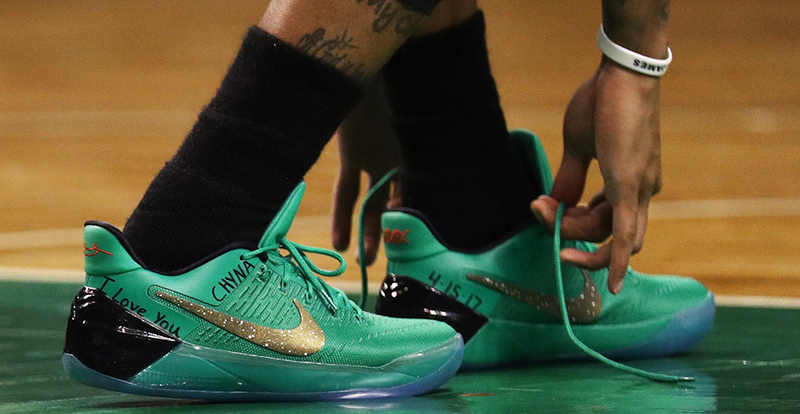 If you can read the captions on Isaiah's green Nike's and not get emotional, you are more stoic than me. The date of Chyna's death (4-15-17). Her name. RIP li'l sis. Heartbreaking stuff. Thomas is signed with the Denver Nuggets and is back on the court hoping to get back into competition in the next few weeks. Writers will impart certain meanings to Isaiah wearing the same green Nike Kobe A. D.'s. Will Danny try to trade for him in the next four days in preparation for the playoffs? Wouldn't that make for quite a story! Is Thomas trying to downplay the rant by Anthony Davis' father about Ainge's lack of loyalty to his players? Could be. My guess is that since Isaiah may be back in Boston on Monday, March 18th when the Nuggets come to town, he will be assured of a thunderous welcome from the crowd that adores him. 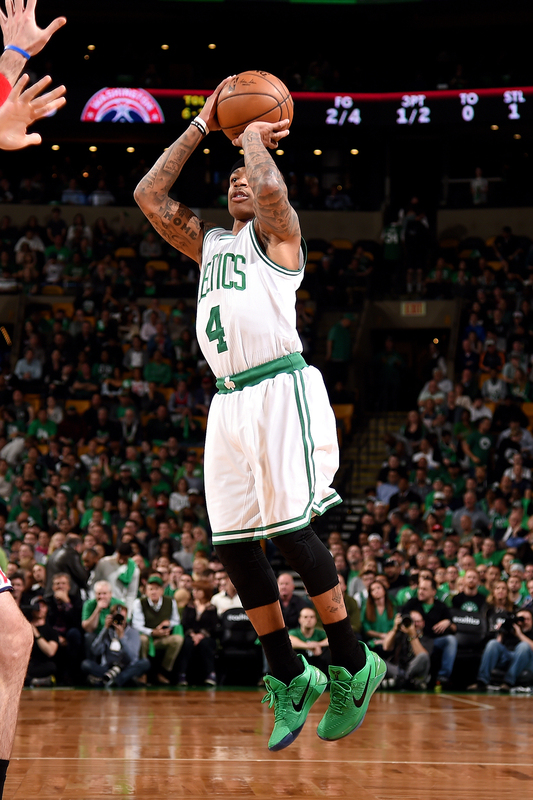 But he would also like a friendly reception from the Celtics front office (read Danny Ainge). Thomas has had a much better career than most expected, but his time in Boston were his glory days. He would like to have more of them. The King of the Fourth Quarter, aka The Most-Beloved Short-Term Celtic, is back on March 18th. I will be closely monitoring his progress during his comeback. Stay with us.